The oils are incredible! I used them in just about every way I could think of and then loved them so much went looking for more projects! LOL! I put a couple of drops of lavender on my pillow and have slept like a baby. I tried them all in my warmer… wow! The scent filled the space and lingered for a long time after the burner turned off. I added several drops to a laundry load of fitness clothes and they left them smelling awesome! I can’t wait to work out to see if the scent reactivates with heat and sweat… LOL! Then added some to a dead sea salt scrub my hubby got for me and gave myself a kickass pedicure/manicure scrub first. And also, added some to lotion and rubbed it onto hands and feet and put on my special gloves and footies. My bodybuilder hands are so soft and my tired feet feel refreshed. This is the great article I found, 101 Ways to Use Essential Oils by Dr. Axe. Now I have a bunch more must try uses for what I have and my next order, and the next one, and order after that, etc. LOL! But besides, the incredible scents and million uses, I have to give props to Aroma Foundry themselves. All oils are 100% Pure and All-Natural and sourced from the USA or its Native Country of origin but more than that it’s what that area is ‘known’ for. You can’t get much better than that. 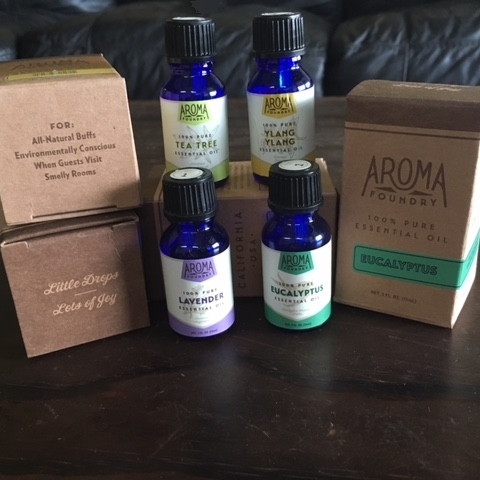 Only processed in small batches, hand bottled, and packaged like a present – Aroma Foundry quality is unmatched, and I’d highly recommend their products. These are the products I tried. But you should check out all of Aroma Foundry’s products. Oh, and read that article by Dr. Axe too, so many crazy cool ideas that even I, halfway to hippy-dippy had no clue about! There’s even one for cellulite! Who knew? Click here to check out all of their products!